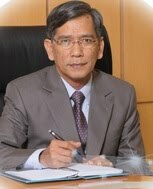 "The government is aware and has taken a quick step by establishing the TN50 as a roadmap that enables us to jump towards achieving the Top 20 Nations in the world," (Bernama). As citizens, we feel very fortunate that in the next 30 years we will be able to enjoy the lifestyle of people in developed and wealthy countries. Can we take this challenge? History has proven that we are capable of implementing it on condition that the economy of the country must be well-managed and implemented in earnest. The closest example is our success to leap from a middle-income country to a high-income nation, as targeted in Vision 2020. In the 2017 report, the International Monetary Fund (IMF) projected Malaysia's per capita income in 2020 is USD 12,447 (see Table below). This per capita income is higher than the USD 12,235 classified by the World Bank as a high-income country. Which countries are ranked the top 20 richest in the world today? Countries that are ranked as richest in the world are classified based on per capita income for 2017. The per capita income is calculated by dividing the total Gross Domestic Product (GDP) with the total population of that country. From the above tables, among the top 20 richest countries in the world today are Luxembourg, Norway, Qatar, United States, Singapore, Sweden, Canada, Germany and Israel. The United Kingdom ranked 22nd and Japan 23rd. Malaysia ranked 68th with per capita income of USD 9,659. 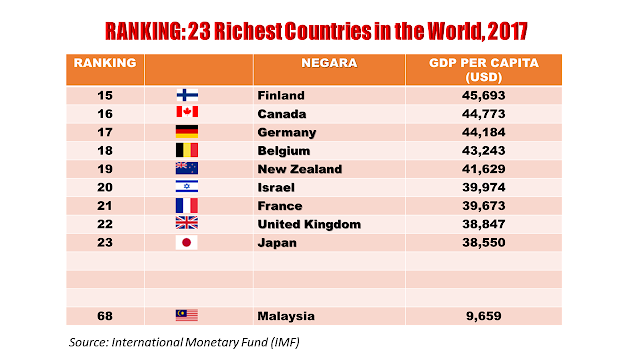 If Malaysia wants to jump to the 20th ranking, what is the per capita income needed? 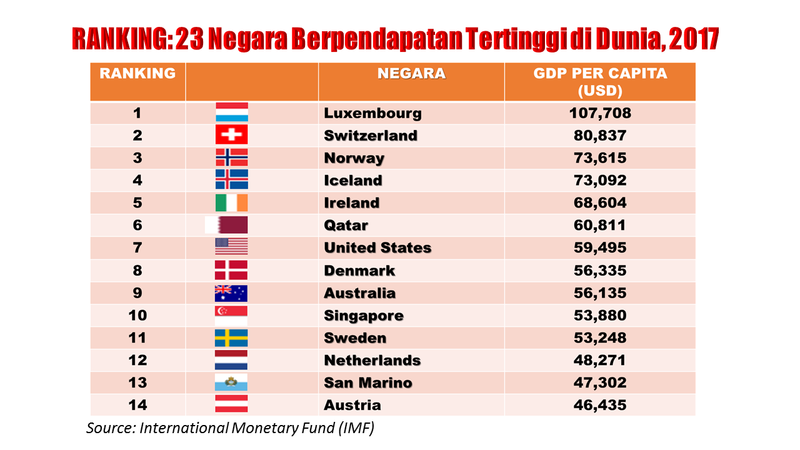 Malaysia needs to have a per capita income of USD 39,974, which is four times higher than now to match the per capita income of Israel who is currently ranked 20th (see table above). With just USD 9,659 now is it sensible Malaysia can increase per capita income 4 times higher to USD 39,974 to rank 20th? Maybe sensible. But that can only be achieved within the next 20 years. Let's take a look at the table below. 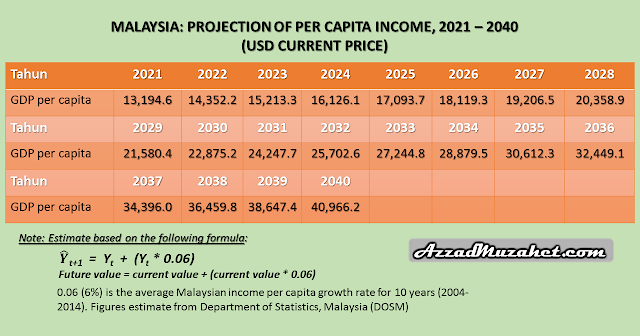 The table above is a projection of Malaysia's per capita income from 2021 to 2040. It is worth noting that the amount has increased from USD 9,659 in 2017 to USD 13,194 for the year 2021. Note also, the numbers continue to increase from year to year. 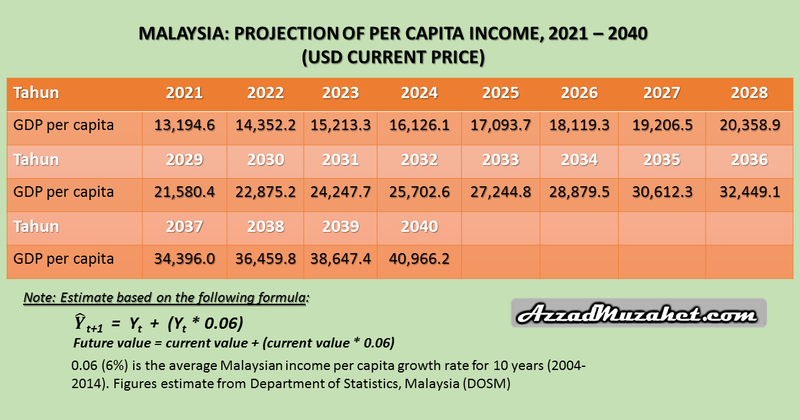 See how much Malaysia's per capita income in 2040? The sum is USD 40,966. Refer back, how much is Israel's per capita income which currently ranked the 20th position? The sum is USD 39,974. Well...!! 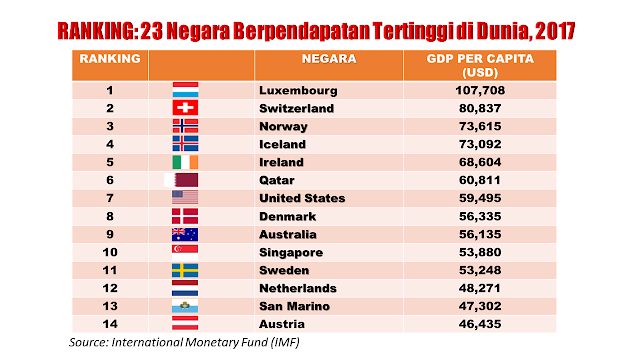 Malaysia's per capita income is higher than Israel...!! If we think simplistically, we now can yell...!! "Not waiting until 2050, by 2040, Malaysians have become richer than the Israelites..!!". In 2040 the Malayians are richer than the Israelites? Will it be reality? It can be a reality if in the next 20 years, per capita income of Malaysians will increase 4 times to USD 40,966 while the per capita income of Israel is unchanged (static) of USD 39,974 over 20 years. But in real life, is there any country in this world whose economy is in a static state for 20 years? Even, countries whose climate is below freezing, the their economy are not frozen. Some people think in a very simple way. If our ranking is 68, we can simply step on 48 other countries in front of us to reach at the top 20 richest countries in the world. But in reality, it is not always the case. As we have shown in the above analysis, Malaysia can only achieve the current value of per capita income for the top 20 richest countries in the next 20 years. By then, all the countries in front of us have pulled away faster and carry their respective rankings, far behind us. At the end, while seeking to rank the 20th richest nation in the world, we tumble, fall and seated on our original rank, ranking 68, the rank not the place for the richest country in the world...! !